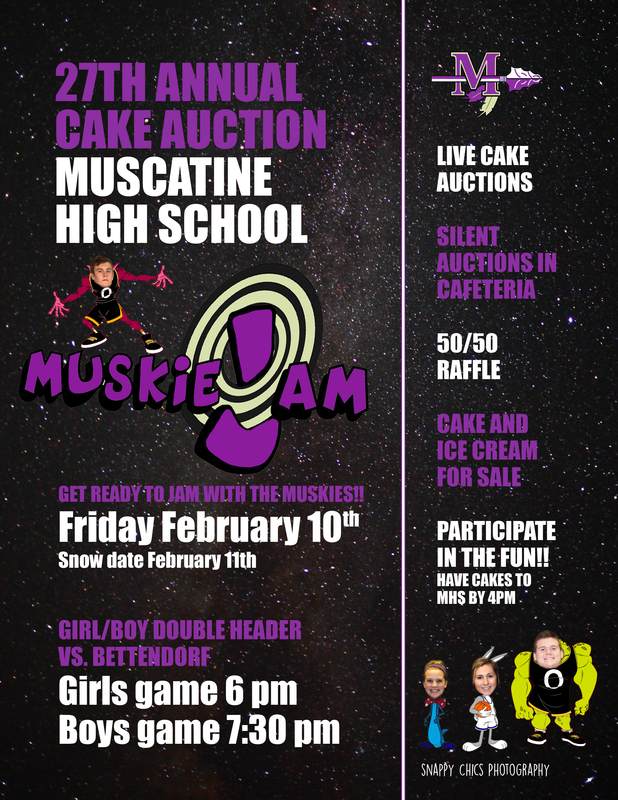 MHS Cake Auction – It’s that time of year for the 27th Annual MHS Cake Auction, Muskie Jam is the theme. Friday, February 10th, Snow date February 11th. Girl/Boy Doubleheader basketball games vs. Bettendorf. Girls game @ 6 pm, Boys game @ 7:30 pm. There will be live cake auctions in the gym, silent auction in the Cafeteria, 50/50 Raffle, Cake and Ice Cream for Sale. Join in the fun! If you would like to bring a cake for the auction, please have cakes to MHS by 4 pm on Feb. 10th. Mr. Armstrong’s freshmen classes will meet in room 228 Tuesday, February 7. Girls’ Soccer Fitness meets on Mondays and Wednesdays at 6:00 a.m. in the upper north gym. Girls’ Soccer Open Gym is on Sunday nights from 4-6 p.m.
8th Grade Transition Presentation – Select the link for information that was presented at the Feb. 1 8th Grade Transition meeting. Race for the Schools – The fifth annual MCSD Race for the Schools – 5K and Muskie Mile fun run will be held on Saturday, May 6th at the Muscatine High School. The 5K begins at 8 am and the Muskie Mile begins at 8:45 am. All students are encouraged to participate. This year, students will receive a 50% discount if they list their school on the registration form. Scholarships are available for MCSD students to cover the registration fees. For more information about scholarships, contact Daphne at daphne.donald@mcsdonline.org This event is designed to promote physical fitness within the community of Muscatine and the Muscatine Community School District. All proceeds from this fundraiser will filter directly back to MCSD students. Funds will be designated to support physical education and student wellness. Special awards will be presented to the business and MCSD School with the greatest participation. Registration forms are available at each school or you can print a registration form by visiting the Muscatine Running Club website at http://www.machlink.com/~muscatinerunningclub/ and clicking on the calendar tab. MCSD Race for the Schools is the second race in the Grand Prix Circuit competition in Muscatine. On-line registration is available at: https://secure.getmeregistered.com/RaceForTheSchools. Registration Fees increase after April 24, so register now! Are you interested in meeting with people from all over the world who are game changers in Food Security issues? Does travel sound exciting? Do you want to make a difference in the world? If you are passionate about feeding the world, meet with other like minded people in Mrs. Kroll’s classroom the second half of Enrichment on Thursday, February 2nd. We will discuss the World Food Prize opportunity. It’s that special time of year again–time for Singing Valentines! Singing Valentines are a musical way to show love to the people you care about at MHS, whether they are students or staff. For only $5, your special someone will be serenaded in beautiful 4-part harmony! For only $2 more, a flower will be presented to your recipient by the singers during the song. Any other gifts or messages must be arranged with Mrs. Burford (teale.burford@mcsdonline.org). Valentines will be sold Wednesday, February 8th through Friday, February 10th, and Monday, February 13th during lunch in front of Student Services and will be delivered on Tuesday, February 14th during lunch/Enrichment. Support the MHS Choral Program and show the ones you love that you care this Valentine’s Day! Girls Track and Field Practice will start Monday, February 13th in the cafeteria and will go from 3:45-5:30. If you have any questions, please talk to Coach Falk in room 11-010 (old AA18) or email him at josh.falk@mcsdonline.org. Local Scholarship Presentation to Seniors will take place throughout the day on February 10th in the Auditorium. Students will be taken by their designated teacher after attendance is taken. MHS Yearbook Purchase Cut-off Date – The last day to order an MHS Yearbook is February 24th. Purchase at the Attendance Center – $56. MHS Baseball Open Gym – If you are considering playing baseball this summer, baseball open gym will begin Sunday, February 12th from 6-8pm in the MHS Gym. Grant Elementary is still looking for volunteers to help at the Grant Carnival on Friday, February 24. The carnival is from 5:00-7:00 pm. Volunteers need to arrive at Grant at 4:30 pm for instructions. Please contact Jaimie Caffery, Grant principal at jaimie.caffery@mcsdonline.org if you are interested.